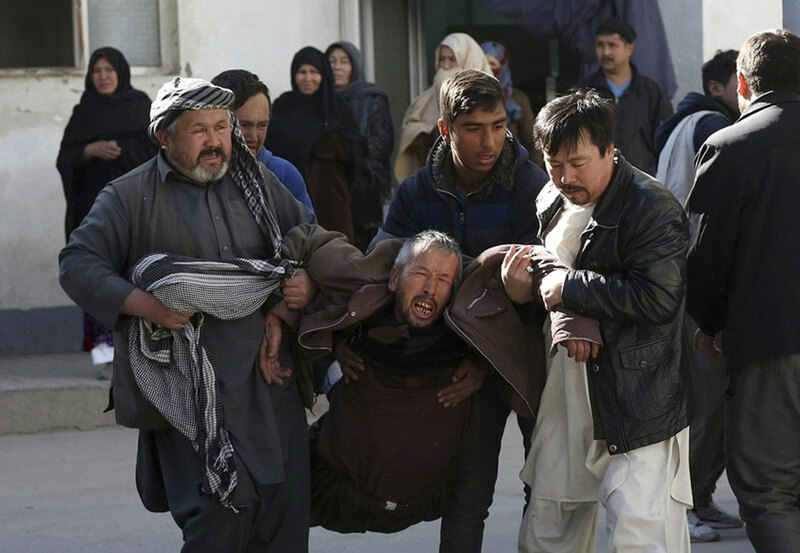 An Islamic State suicide bomber struck a Shiite cultural center in Kabul on Thursday, killing at least 41 people and underscoring the extremist group’s growing reach in Afghanistan even as its self-styled caliphate in Iraq and Syria has been dismantled. The attack may have targeted the pro-Iran Afghan Voice news agency housed in the two-story building. The Sunni extremists of IS view Shiite Muslims as apostates and have repeatedly attacked Afghanistan’s Shiite minority and targets linked to neighboring Iran. “I jumped from the roof toward the basement, yelling at people to get water to put out the fire,” he said. The cultural center was housed in a simple building surrounded by mud-brick homes in the Shiite-dominated neighborhood of Dasht-e-Barchi, home to some of Kabul’s poorest residents. A senior member of the local Shiite clerical council, Mohammad Asif Mesbah, said the center may have been targeted because it houses Afghan Voice. The news agency’s owner, Sayed Eissa Hussaini Mazari, is a strong proponent of Iran, and the agency’s output is dominated by Iranian news. The extremist group is now largely confined to a few remote patches of territory in Syria, but it retains the ability to inspire and carry out attacks further afield. Powerful affiliates in Afghanistan and Egypt’s Sinai Peninsula continue to launch regular assaults against security forces and civilians. Afghanistan’s IS affiliate largely consists of displaced Uzbek militants and disgruntled former members of the much larger and more entrenched Taliban movement. The Taliban and IS share the goal of overthrowing Afghanistan’s Western-backed government and imposing a harsh version of Islamic law, but they are fiercely divided over leadership, tactics and ideology, and have clashed on a number of occasions. The Taliban denied any involvement in Thursday’s attack. Pakistan, which Afghan and U.S. officials have long accused of harboring militants, condemned the “dastardly” attack in Kabul and vowed to stand with Afghanistan in its fight against terrorism. Pakistan has denied that it shelters militants and has in turn accused Afghanistan of failing to crack down on extremist groups. President Donald Trump has ordered an additional 3,800 U.S. troops to Afghanistan since announcing a new strategy in August aimed at ending America’s longest war, bringing the total U.S. forces there to at least 15,000. Islamic State Kills 41 in Attack on Afghan Cultural Center. The attack may have targeted the pro-Iran Afghan Voice news agency housed in the two-story building. The attack wounded more than 80 people, many of whom suffered severe burns.